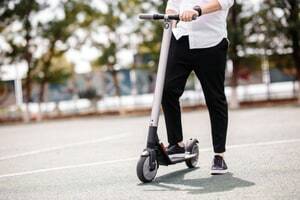 Should you be injured on a Lime, Bird or Bolt vehicle anyplace in the State of Florida, contact this Fort Lauderdale Electric Scooter Accident Lawyer today. An electric scooter is one that is powered by electricity, instead of gasoline (as such, it needs to be charged periodically). While electric scooters can be fun and can be an efficient method of transportation, they can also be quite dangerous. Electric scooter crashes can be caused in a number of different ways. For example, the electric scooter itself might fail. If this occurs and you are hurt as a result, then you may have a products liability case against the manufacturer of the scooter (or the company that maintained the scooter). Three major companies that offer electric scooters in Florida are Lime, Bird and Bolt. If the electric scooter you were using failed and caused your injuries, then you may have a case against one of these companies. In this case, it is extremely important that you preserve the electric scooter which caused your injuries. One of the unique things about an electric scooter products liability case is that the company which owns the electric scooter frequently takes the scooter back after the accident. After all, after a crash, the injured person frequently goes to the hospital. Subsequent to this, the electric scooter company will frequently retrieve the scooter, and there is no way for the injured person (or Mr. Quackenbush) to get ahold of it. In this case, Mr. Quackenbush will send the electric scooter company a “preservation letter” telling the electric scooter company to hold onto the electric scooter and not make any changes to it (as it is evidence in your case). If the electric scooter company proceeds to dispose of the electric scooter or alter it after receiving this letter, then it can face severe sanctions in court. The reason this is important is because, in a products liability case, you typically need the product in order to prove your case. After all, without the product, there is usually no way of showing that there was something defective about it. If you do have the product, then Mr. Quackenbush will usually hire an expert to inspect the product and determine what exactly went wrong. This is why it’s important that the electric scooter company preserve the electric scooter after a crash, and it is the reason Mr. Quackenbush sends the preservation letter. Electric scooter accidents can also be caused by other vehicle drivers. For example, while riding an electric scooter, you may have been hit by the operator of another vehicle. In this situation, your case will typically be against the driver of the other vehicle (rather than the electric scooter company itself). Finally, electric scooter accidents can be caused by defects in the roadway (for example, a pothole or crack in the sidewalk). If this occurred to you, then your case will typically be against the owner of the property where your wreck occurred. One of the challenges in an electric scooter crash case is that, when signing up to use the scooter, the operator of the scooter typically signs a waiver form promising not to sue the scooter company in the case of a wreck. If you did this and you were later injured, this won’t prevent you from bringing a case against another driver who caused your injuries or the property owner where you were hurt, but it could arguably prevent you from bringing a case against the electric scooter company. As of now, this issue has not been argued in Court though, so it is still undecided. As such, the signing of a waiver should not deter you from bringing a case. One of the most dangerous things about electric scooters is that many scooter drivers do not wear helmets. Most electric scooter companies advise operators to wear helmets while operating the electric scooters. However, typically these same electric scooter companies do not provide helmets to scooter operators, and it is unreasonable for them to expect that all scooter operators will carry helmets with them. Not wearing a helmet during the operation of an electric scooter can lead to all sorts of head injuries and conditions in the case of a collision. These include brain injuries, brain bleeds, brain damage, comas, paralysis, and vegetative states. It is therefore extremely important to wear a helmet while operating an electric scooter. If you have been hurt while on an electric scooter anyplace in Broward County - including Coconut Creek, Cooper City, Coral Springs, Dania Beach, Davie, Deerfield Beach, Hallandale Beach, Hollywood, Lauderdale-by-the-Sea, Lauderdale Lakes, Lauderhill, Lighthouse Point, Margate, Miramar, North Lauderdale, Oakland Park, Parkland, Pembroke Pines, Plantation, Pompano Beach, Southwest Ranches, Sunrise, Tamarac, West Park, Weston and Wilton Manors) – call 954-448-7288 to speak to Mr. Quackenbush today. He will give you a free, no obligation consultation.